All around Spain murals seem to be being created to spruce up once downtrodden neighbourhoods. Valencia is no exception to this and, alongside some longer standing works of art, there are some new and impressive projects. 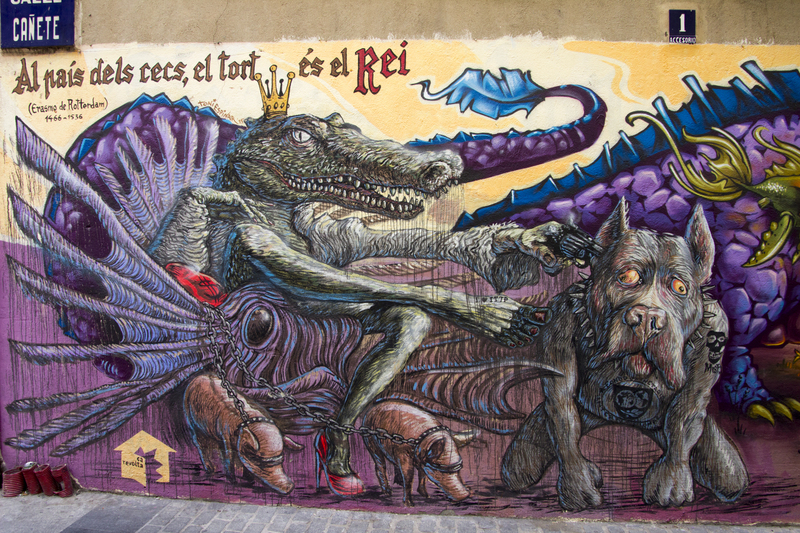 Wherever you wander in Valencia you will see graffiti and murals. Some of it is tacky, some of it is clearly vandalism, but a great deal of it is without a doubt serious artwork. In this blog I’ll show you four places to look, all to the north and west of the cathedral and central market area, but around every corner you will find more! 1. Let’s start with the city’s newest official mural project – Calle Moret. I read about this when a Spanish friend put a link to this article on Facebook (in Spanish). There are not many works of art on the walls of this street but what there is demonstrates the high quality of artistic work which is around. Each picture was created using from a photograph and you can see a poster showing the originals on a nearby wall. They have called it La Calle de Colores, the street of colours. The picture of the kissing couple has a curious back story. The image comes from a still from a video taken at London Bridge Station on 14 August 2012. Using the hashtag #kissmevlc they are trying to track down the couple who have now been immortalised on Valencia’s streets! As far as I can see, they have yet to be identified. The Youtube video below shows the painting being created in time-lapse. 2. The second area highlighted on the map is clearly politically motivated. Images cover the walls and it’s not difficult to deduce the meaning from most of the pieces. 3. The third area is just to the north of Placa de Tossal, a part of the town where you will find a rather bohemian mix of bars and restaurants. There are many excellent works on the walls as you wander around this area. 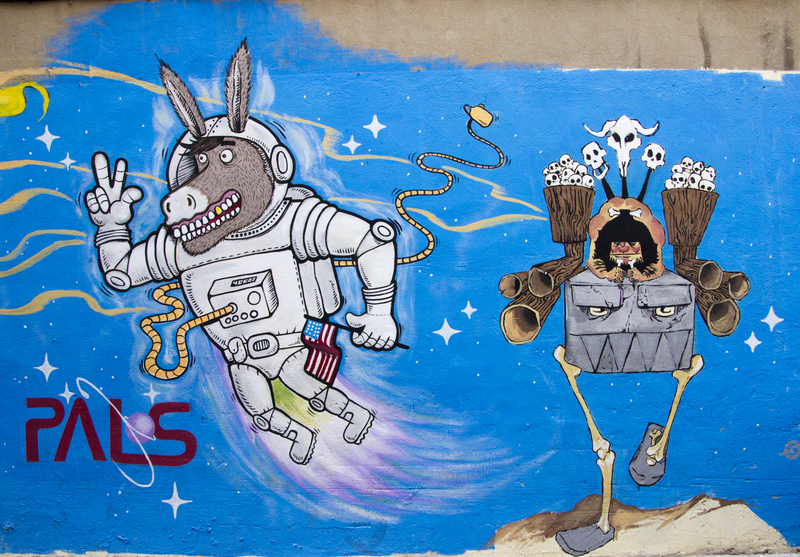 Get lost in the streets of El Carmen and you may find yourself in a visual wonderland! 4. 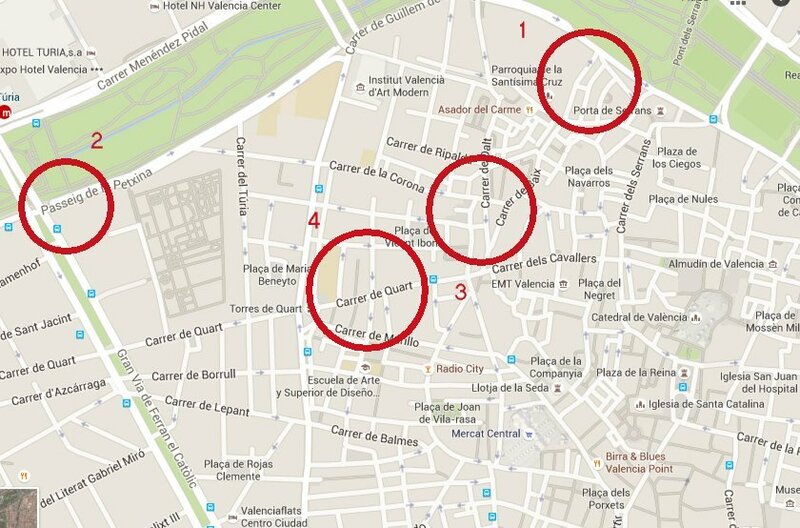 Finally there are a couple of streets close to the Torres de Quart which are definitely worth finding. Here you are transported into a fantasy world with space-suited donkeys and, well, I don’t know what else is there with him! There are so many other works of art around the city. Wander around, get lost, and enjoy the show!